Read below for recent press mentions featuring our technology solution, CEO, and customers. Kait 8 News reported on the grand opening of Powell Assisted Living and Memory Care in Columbus, Ohio. The news segment highlighted HeartLegacy, one of the community’s core amenities, as an “emerging” and “user-friendly” technology. Healthcare at Home: The Rowan Report, a publication covering the home care industry, interviewed our CEO, Walt Armentrout. 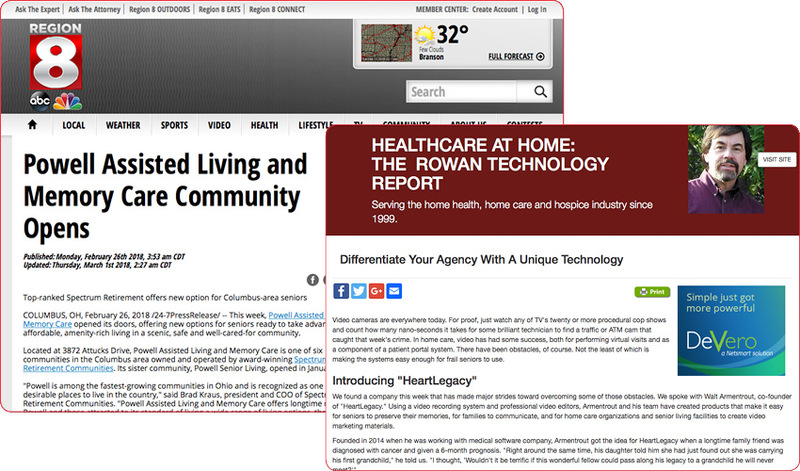 The interview was part of a feature article discussing HeartLegacy’s founding, and how home care agencies use HeartLegacy to differentiate themselves from competitors. Click here to read the feature article.